When I needed to suggest a place to meet up with my two best guy friends from school (wow it is strange to think we have all known each other for over 12-14 years) I did not need to do any research into where to eat whatsoever. 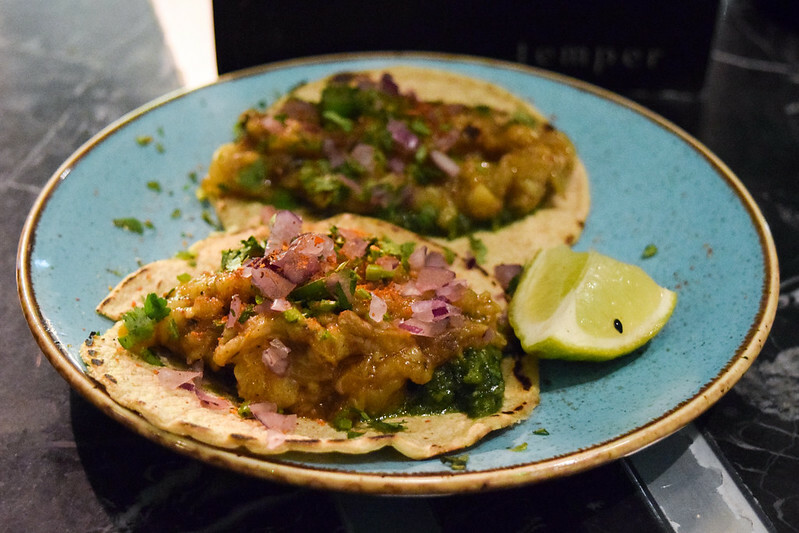 I’ve wanted to go to temper for ages to try their slightly Mexican, slightly Italian take on flame grilled foods, so it seemed like the perfect suggestion for a few sharing plates and cocktails after work. 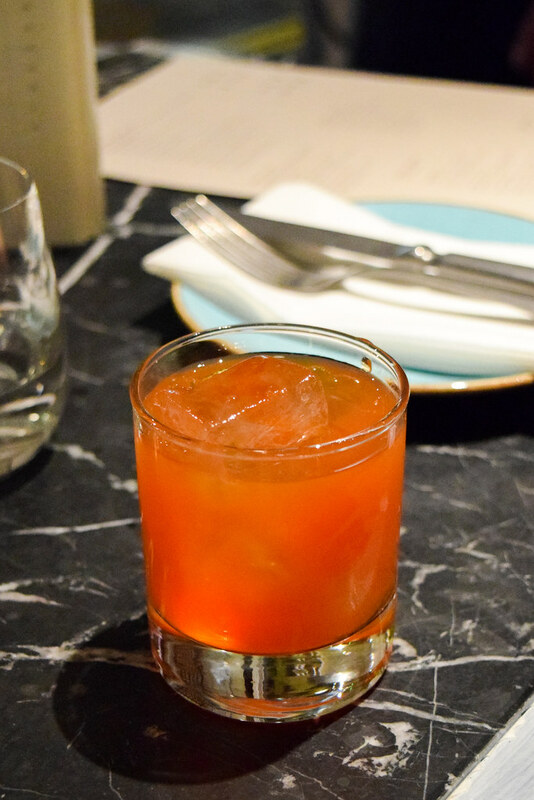 The drinks at temper are really, really good. 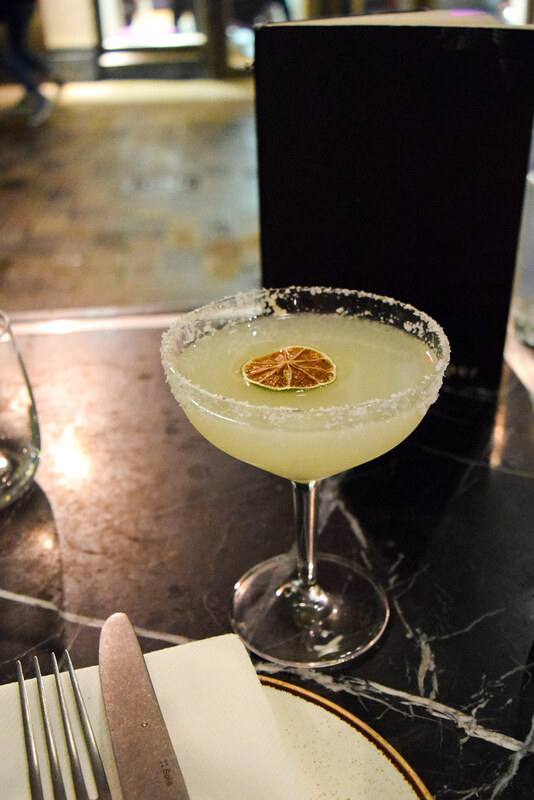 I’m a classic margarita girl through and through so when I saw they had a smoky, classic version on their menu I started with that while I waited for the others. It was a good margarita, one for people who like the classics done right. 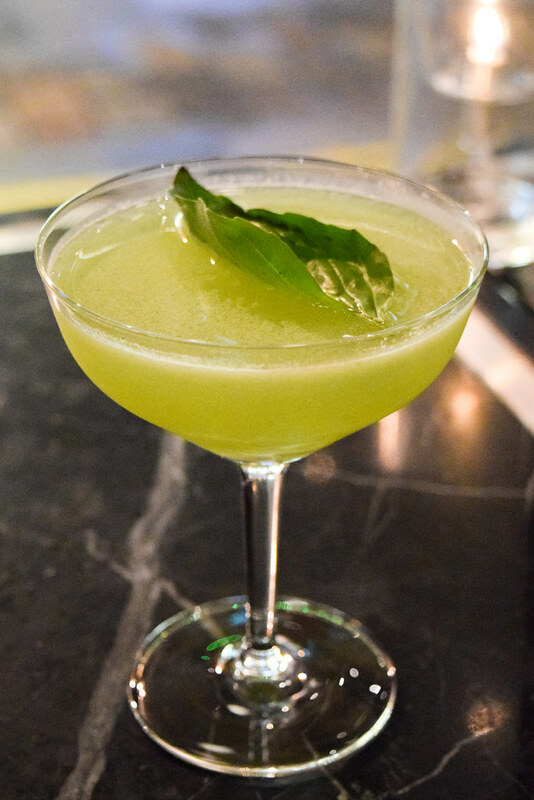 The green one, a Mr Faulty (white rum, basil, rice wine vinegar and lime juice) is great if you like short, strong but still refreshing cocktails, and Eddie, the negroni fan at the table was really impressed with the Turmeric Negroni, the colour of which my photos don’t really do justice. To start, some tacos to share. 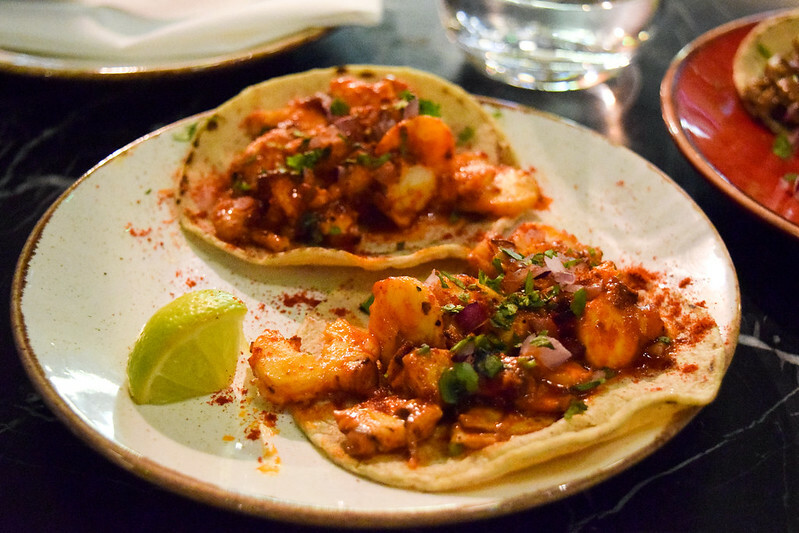 My one, must order pick from this trio of excellent tacos is the octopus: beautiful, smoky, tender slices of octopus in a spicy sauce (enough to give them a kick, but not too much to be overpowering) with a hit of paprika served on a perfect mini corn tortilla. 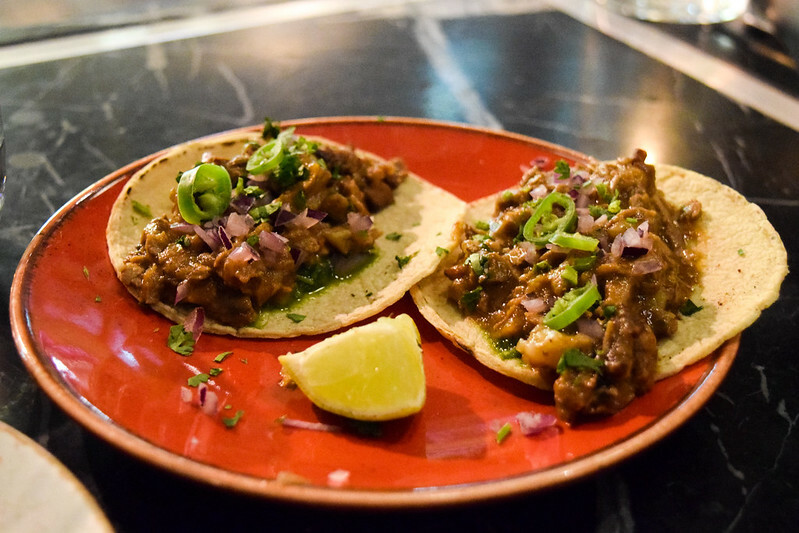 The braised goat barbacoa tacos are very classic and very simple, but really showcases the goat meat so one to get if you’ve not had it before. 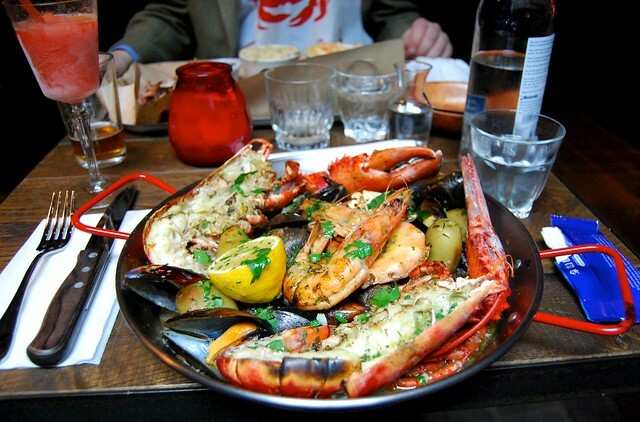 I did not get a bite of the burnt aubergine tacos, but the two carnivores dining with me seemed to enjoy them! 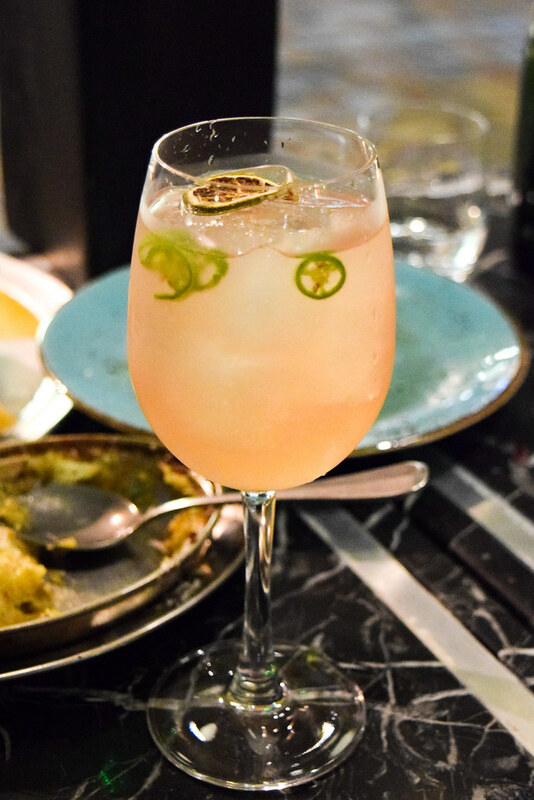 Another drink (a Sweet & Spiced Spritz made with balsazar rose, chilli gin, dolin chamberyzette and prosecco, I think the best drink I had and the one that paired with the food the best) accompanied out mains, two of their flatbreads to share. 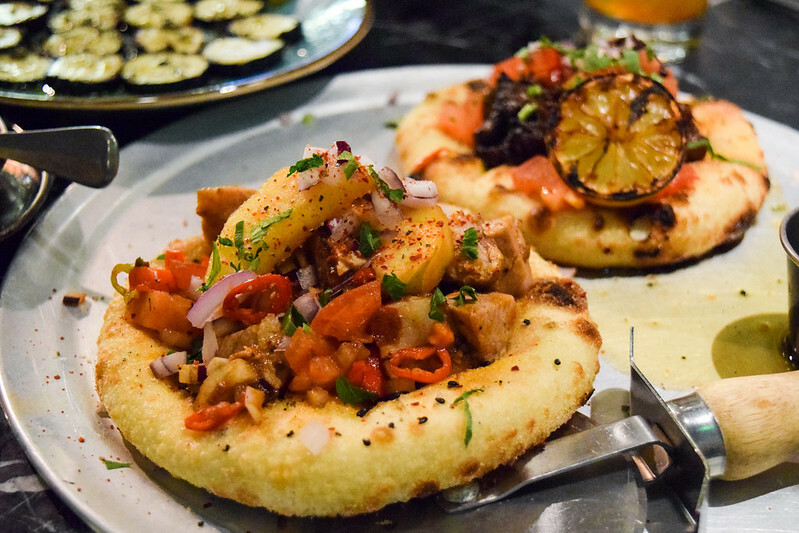 Like mini pizzas atop a beautiful dough, they were both delicious, packed with delicious hunks of meat and other perfectly paired flavours. 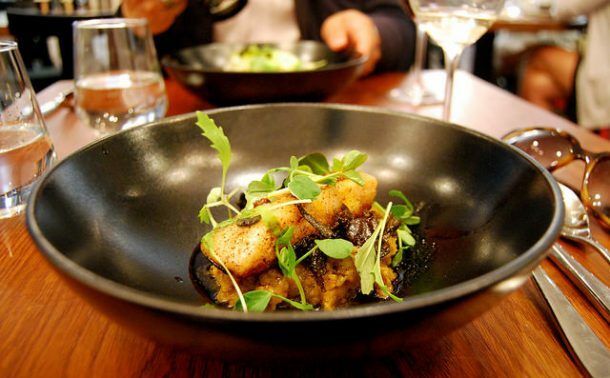 The pork barbacoa was great for the season, served with caramelised apple, but the real star of the show was the ox cheek served with beef fat and caramalised lemon. 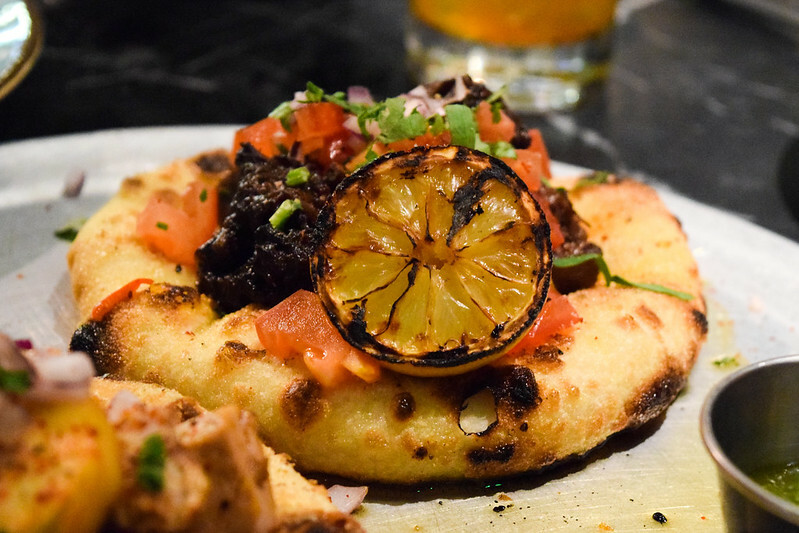 Regardless of what you order at least one flatbread to share is a must, they’re like mini pizzas, but worlds more exciting! The sides were mixed. 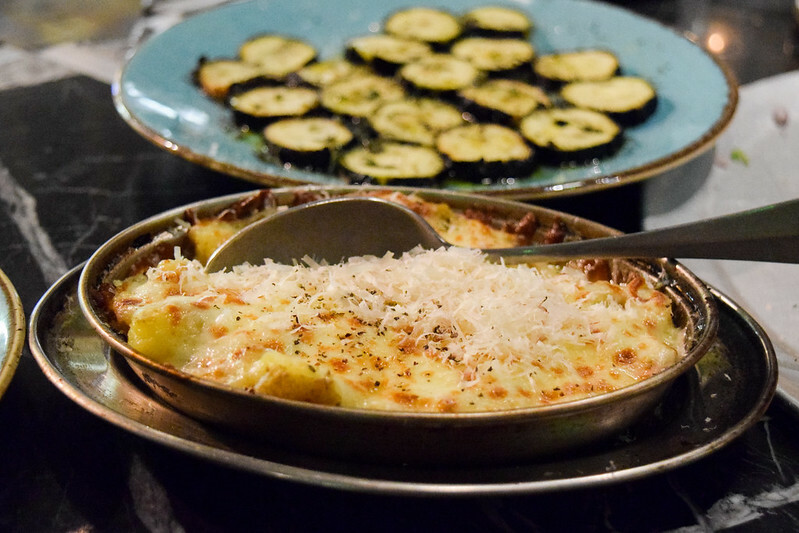 Our server said the beef fat potatoes served with mozzarella, sage and black pepper were their most popular, but I could leave them; it was a good dish, but the amount of cheese meant the potatoes were not crisp at all, the the whole thing was just a bit too heavy to get through. 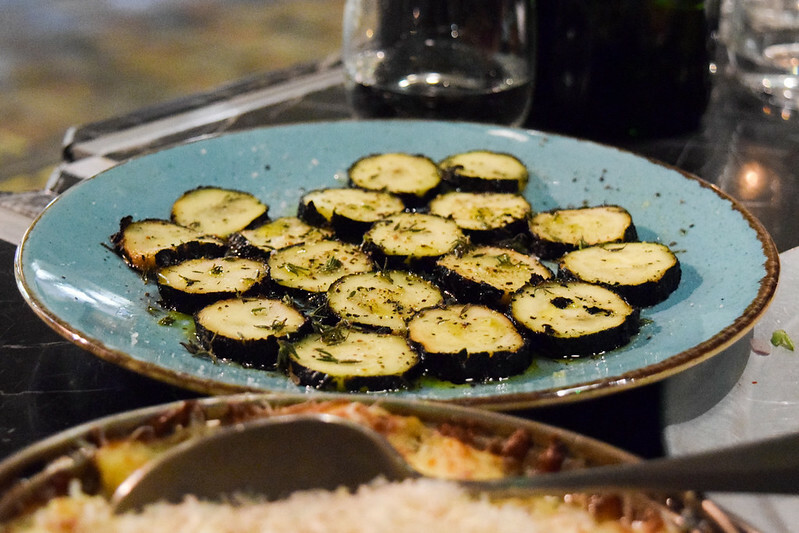 The grilled courgette salad, however, was the best thing we ate at temper, ignore all the main dishes. One of the boys has already asked me to figure out the recipe for it at home, but re-reading the menu online I think I’ve figured out why it is so addictively good: it lists msg as one of the components (as people who do a lot of Chinese home cooking will know, it is nothing to be afraid of!) Regardless, get this or you will seriously regret it. 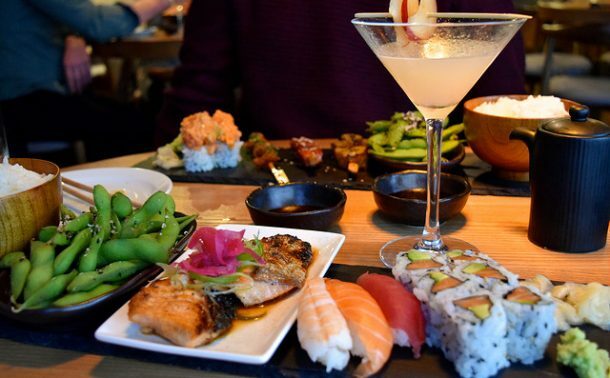 While with sharing plates that are on the larger side it can be tempting not to, when dining at temper you really need to leave room for dessert. 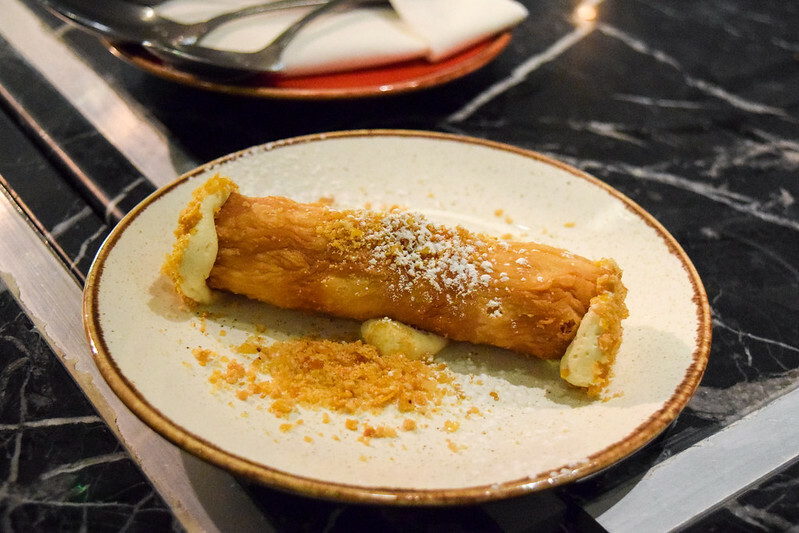 I tasted a bit of Eddie’s honey nut cannoli and it was bloody delicious, but I’m still thinking about my dessert now – and I’m not really a dessert person. 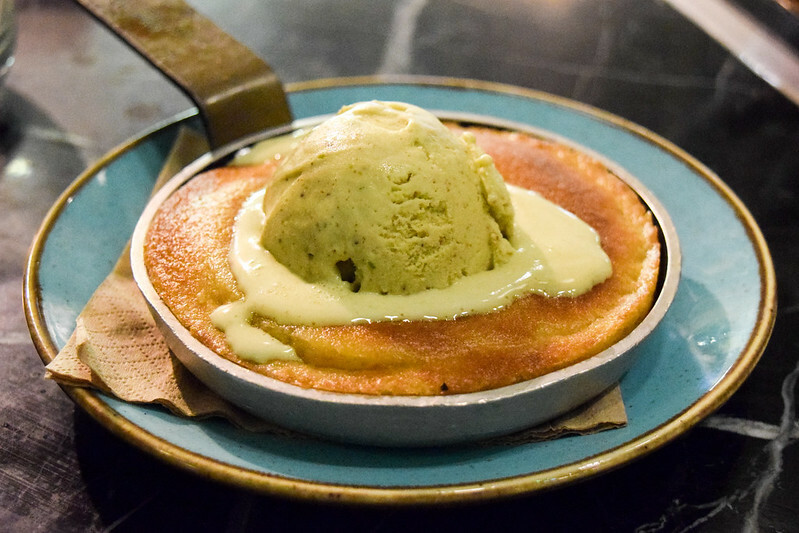 Their deep dish, soft, tender, melt in the mouth nutella cookie is served in a skillet, typically topped with peanut butter ice cream which I switched for their fantastic pistachio ice cream to make an indulgent, more-ish, part grown up part childhood classic dessert. 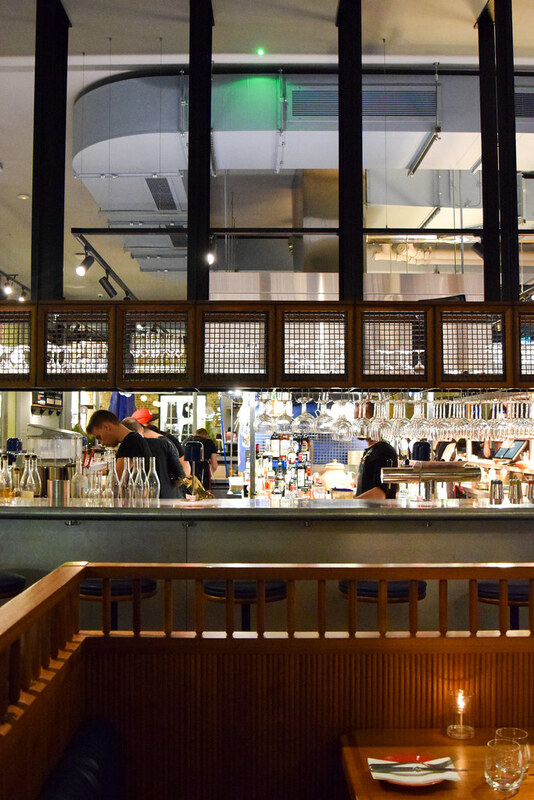 The original temper is in Soho, but if you’re in need of a new dinner spot that is perfect for cosy, cold winter cocktails and sharing dishes among friends, as well as this Covent Garden spot they have one in the City, and do a killer looking lamb shoulder to share by way of a Sunday roast, too. For more details, check out their website.